Think about the way domains and email addresses work. We (individuals and/or companies) own these identifying data elements and we can provision them in any app we want (I provision my email addresses in gmail and my domains in wordpress but I could choose many other options). In Web 3, this is how all of our data will work. But we have a long way to go to get there. The infrastructure for Web 3 is immature and at least a few years away from being mature and stable enough to build mission-critical dApps on. We can see glimpses of Web 3 in games and collectibles, where the stakes are not that high, and we can see glimpses of it in financial services that have built up around Bitcoin and other leading crypto assets. But it will be a while before we are keeping our resumes on DinkedIn and our documents on DDocs, our friends and family networks on Dacebook, our photos and videos on Dinstagram, and our President’s tweets on Dwitter. But that time will come. I am more sure about that than anything else right now. The last few years of Web 2 have shown us what is wrong with the current architecture of the web and what we need to do to fix it. When this all happens is another thing. 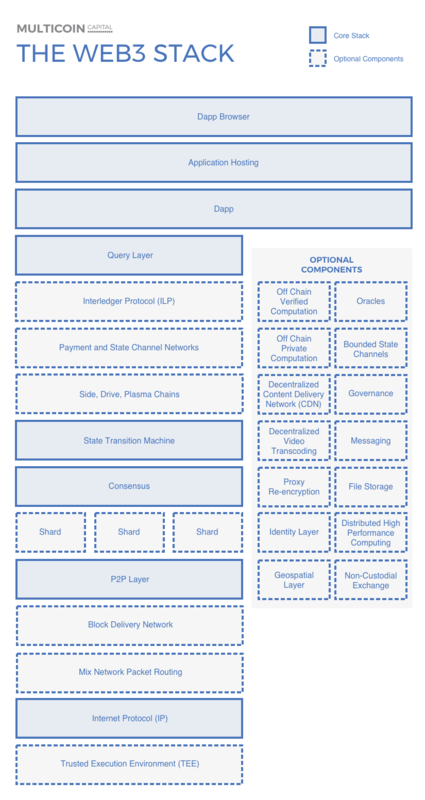 Our friend and colleague Kyle Samani posted a long and thorough description of the current state of the Web 3 stack yesterday. My colleagues Albert and Nick provided some feedback on it before he published it so it reflects some of our thinking too. As investors, we are spending much of our time wrapping our heads around these infrastructure layers, trying to understand which approaches will win out, where value will accrue, and when dApps can be successfully built, scaled, and delivered to market. We think this is where the action is right now and we are heads down in this mess trying to understand it and invest in it.